This beautiful palladium dress ring incorporates our customer's own 16.5 x 9.5mm Aquamarine with two new 1.5mm princess cut H SI diamonds. The aquamarine has been set in a four claw setting held in a 3.5mm wide, d shape profile shank. To finish the ring has been polished to a high shine. 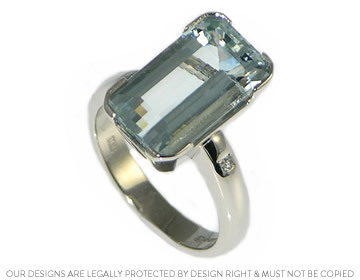 Bespoke 9ct yellow gold Dress ring with customers own ~10.2x7.4mm emerald cut 3.42cts Aquamarine. A 9ct white and yellow gold ring with an 0.75ct Aquamarine.